Cabbage rolls are not our most beautiful food, but they are so savory and delectable that their looks are quickly forgiven. 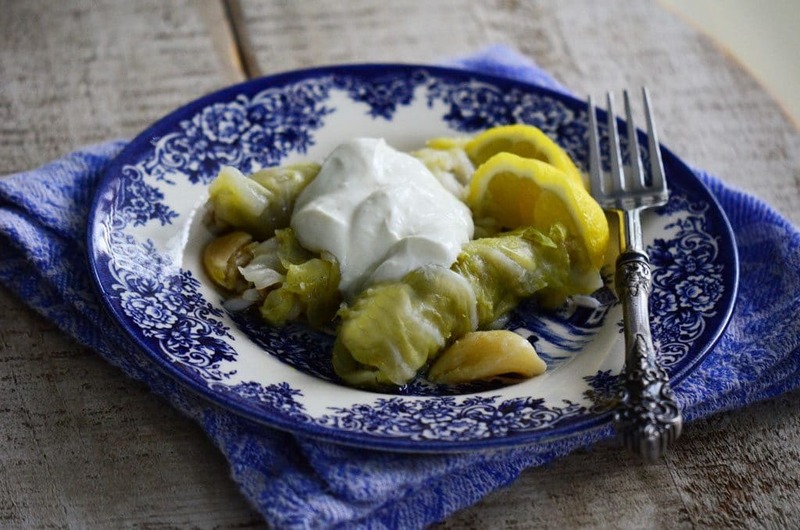 Cabbage rolls can be cooked in water, chicken stock, or tomato juice. They can be as garlicky as you like, or not at all. Lemon can be added to the broth or served alongside the rolls, or both. The way to create the best flavor in the rolls is to coax many layers of flavor—by salting the blanching water for the leaves, soaking the rice in the spices for the stuffing, and salting the cooking water. A little butter doesn’t hurt anything, either. 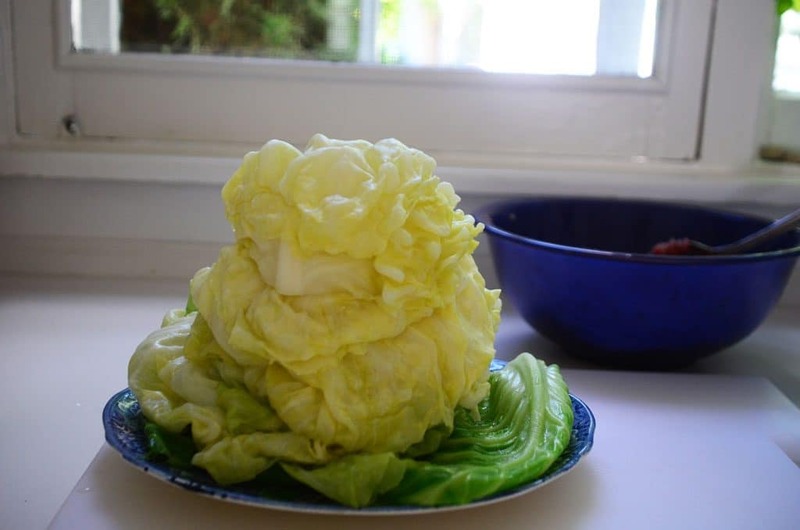 Blanch the head of cabbage and remove the leaves one by one. 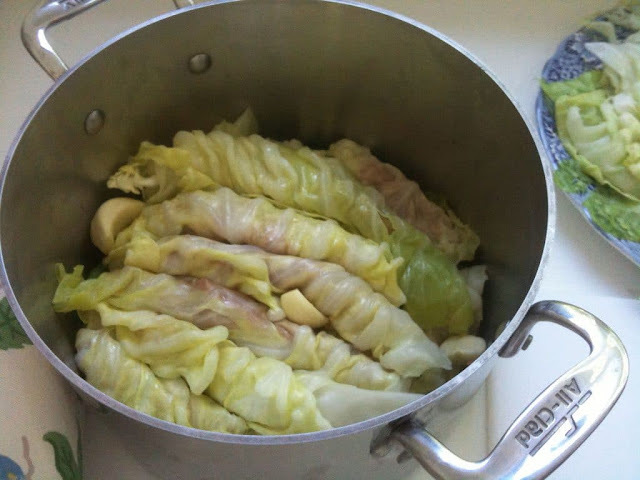 In order to roll the blanched cabbage leaves, the thick rib must be cut out of the center of each leaf. On the small leaves, the rib can simply be shaved down rather than cut out entirely. Then trim the leaves to remove any torn edges and to make some of the larger leaves a more manageable size. Each leaf should be about six inches long. Some will be shorter, and some will be longer. This is fine. Place the trimmings and any very large, dark leaves in the bottom of a medium-sized heavy pot. Rinse the rice twice to remove some of the starch. In a medium-sized bowl, combine the uncooked rice with the melted butter, cinnamon, salt and pepper. Let this mixture sit for about 10 minutes for the rice to absorb the flavorings. Taste the rice and adjust the seasoning, keeping in mind that the seasoning will also flavor a pound a meat, so it should be strong. Add the meat and mix with the rice mixture until combined. Add the water to loosen the mixture, and combine. To taste the mixture for seasoning, place a small ball of meat in boiling water (use the cooking water from blanching the cabbage) for a minute, then taste and adjust seasoning. 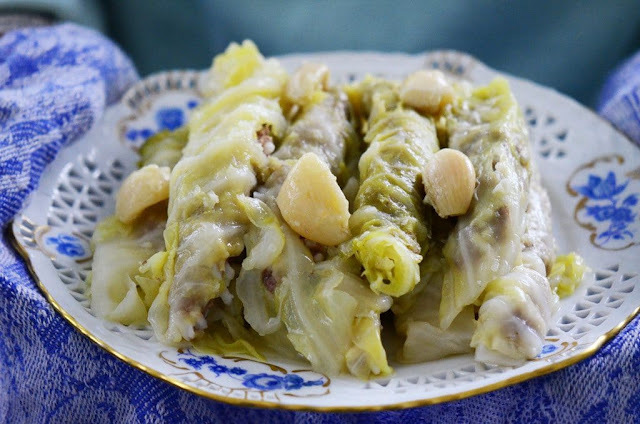 Lay about a tablespoon of the stuffing on a cabbage leaf and spread the stuffing into a long row lengthwise along the leaf. 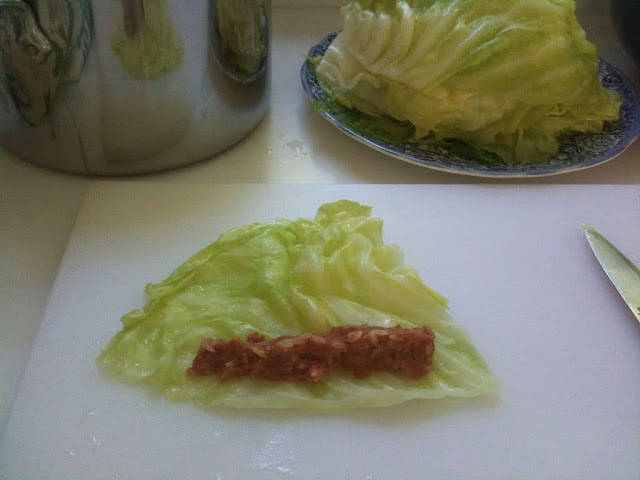 Roll up the leaf around the meat (no need to tuck the edges). Stuff each leaf in this manner, then place each roll in the prepared pan snugly against one another. Run each layer of rolls in opposite directions. Scatter the garlic cloves over the rolls throughout the pot. Place a small plate over the rolls to hold them down while they cook. Cover with cold water (add lemon to the water if using, or use chicken stock or tomato juice instead of water). Add about 2 tablespoons of salt to the water. Make small meatballs with any leftover stuffing and place those in the pan. Place the pot over high heat and bring to a boil. Taste and add more salt if needed. Reduce heat to simmer, cover the pot, and cook the leaves until the rice and meat are fully cooked, about 30 minutes. Serve warm with the cooked garlic cloves and labne.